One of the best things about traveling is the opportunity to discover the unexpected ... going out exploring, and seeing something that you hadn't planned on. And the discovery doesn't have to be spectacular for it to be interesting. Her's an example: a bronze sculpture that I came across while wandering around Fort Benton last fall. 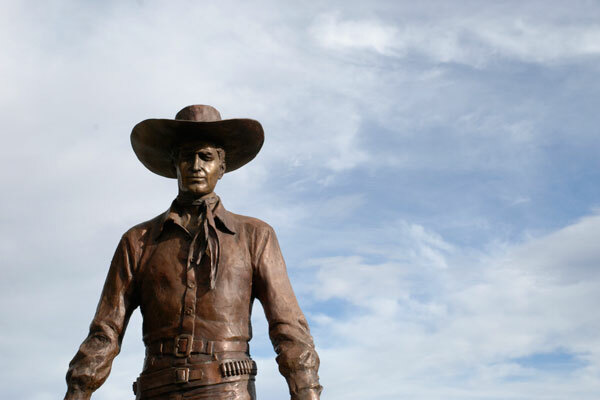 I was surprised to see that the statue is a likeness of the late actor George Montgomery, and I wondered what the heck it was doing in Fort Benton. It turns out that Montgomery was born in the little Montana town of Brady -- but that's an hour's drive away, so I'm still not sure what he's doing there.